1. First divide two sections of hair on both sides of the temple. 2. Add a section of hair on the back of your head. 3. Then braid the 3 sections in the back. 4. Twist the two front sides braids toward the back. 5. Then secure with bobby pins. 6. Overlap each braid and tuck the ends under the braids. 7. 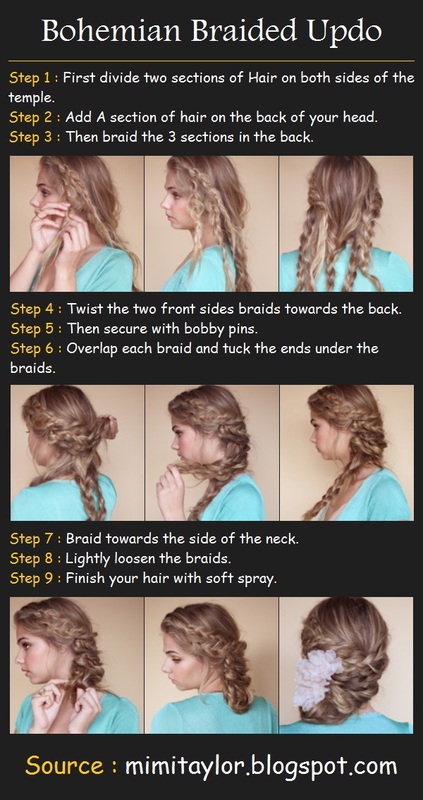 Braid towards the side of the neck. 8. Lightly loosen the braids. 9. Finish your hair with soft spray.